When TracFone, the fifth largest wireless company in the U.S. and the first among prepaid carriers, hired advertising shop Droga5, it didn’t come looking for a standard ad campaign. So Droga envisioned the brand as one with the potential to eliminate a plague in American public schools: the achievement gap between affluent students and their low income peers. The result is the “Million,” a branding-meets-social-enterprise-experiment where middle school students receive cellphones and earn minutes in exchange for reading books. The campaign was developed in collaboration with Roland Fryer, the head of Harvard’s Education Innovation Laboratory (EdLabs), who’s studied whether incentives can prod students to dedicate more time to academic achievement. On Oct. 8, the Million kicked off a pilot program, handing out Samsung phones to 1,500 sixth and seventh graders in Oklahoma City. The phones come preloaded with 300 minutes of talk time. Within the 1,500 participants, there are several cohorts that will allow EdLabs to study what motivates students. Some kids will get a certain number of minutes each month. Others will have to earn their minutes: For every point that a student racks up, he or she gets 10 minutes of usage time. (Reading Green Eggs and Ham gets a student half a point, whereas War and Peace is worth a whopping 45.) Another subset of students will receive daily texts offering informative factoids, like how a high school diploma translates to $1 million in added earnings over one’s career, to see if messaging is a motivator. 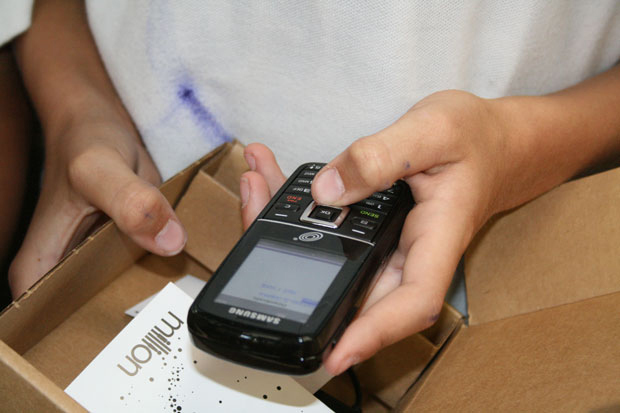 A control group will be made up of 400 students who signed up for the pilot, but did not receive phones. The Oklahoma City experiment follows a five-month, Million trial in early-2008 in New York City. Fryer, in his role as chief inequality officer of the city’s Department of Education (NYCDOE), gave phones to 3,000 middle school students in seven schools. However, a mandate from Mayor Michael Bloomberg that cell phones be banned from schools along with, what Droga5 CEO Andrew Essex calls, the NYCDOE’s “intractable bureaucracy” relegated the project to merely a proof-of-concept. The short New York stint demonstrated that the cellphones were paying off. More than 75 percent of parents whose children participated in the program noted that their kids spent more time on homework, studied more with friends, and got better grades. Also, in 2009, the British design council D&AD recognized the Million with its prestigious Black Pencil award. EdLabs’ previous work on incentive schemes prompted the idea to focus on educational inputs (like reading), rather than outputs (such as test scores). In 2007, It introduced incentives in four city public school systems: In New York, middle schoolers earned cash for scores standardized tests; in Chicago, 9th graders could earn money for grades, receiving half right away and half upon graduating; in Washington, D.C., middle schools chose four or five metrics (such as attendance and behavior) to incentivize kids, who received “paychecks” every two weeks; and, in Dallas, second graders racked up $2 for every book they finished. This innovative program is not only a win for students in Oklahoma City, but also a score for TracFone, which can shed its association with so-called “burner” phones used for drug deals, a la The Wire.